For DEO post, total 4670 candidates have been qualified in DEST out of 7396 candidates and for LDC, 4709 out of 9887 candidates. To view the roll number of provisionally selected candidates through SSC CHSL 2013 recruitment, check here. To check the final cutoff marks for DEO and LDC posts and other detailed information, check here. 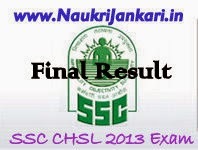 0 comments for " SSC CHSL 2013 (DEO & LDC) Final Result declared "